Have the remains of a marketplace or shop been found at any of the Indus sites? Are there any structural remains in any of the Harappan sites to point to a marketplace or shop where goods were bought and sold? What do scholars have to say about the market system in those days, apart from the well-known theory of goods being stored in a storehouse and taken by boats for trade? There are numerous areas in Harappan sites that have been identified as market places or shops. The site of Shikarpur, in Gujarat has an open area in the center that is thought to be surrounded by workshops and this may have been a market place. At both Harappa and Mohenjo-daro there are many open areas in the cities that are thought to have been plaza or open market areas. Small rooms along the main streets could have been shops at the street level with workshops above or in the houses behind the main shop. Not with certainty. However, at Mohenjo-Daro and Harappa some rows of modular houses (houses with the same simple groundplan, planned and probably built at the same time) facing on streets and open spaces have been considered shops. But the archaeological evidence is partial and not resolutive. Also, some scholars proposed that the open spaces between "Citadels" and other parts of the settlements, for example at Mohenjo-Daro and Dholavira, could have been used for public meetings and markets, but, again, this is not demonstrated. The concept of “shop” and “marketplace” was very different in pre-industrial societies. Production and selling were often connected and there was not a developed wholesale market for most of the products, both food and handicraft. Products were probably sold directly by at the workshops, while food markets were probably set regularly in open areas. However, the complexity and capillary organization of the Harappan economic system might have led to the creation of selling networks for specific products within the single sites or among different sites and regions. Of course, this evidence is very difficult to be detected in the archaeological record in absence of written sources. Small, identical rooms aligned along a street between HR-B and GFD Areas at Mohenjo-Dato have been interpreted as possible shops on the base of parallels with contemporary cities in South Asia, but I am always very cautious about the reliability of such comparisons. Nothing resembling what would be called a “retail shop” in the modern era has ever been identified at an Indus Civilization site. However, “workshops” – structures or areas where some sort of goods manufacturing took place – have been discovered. Although goods made in such locations might have also been “sold” (bartered, exchanged, traded) on the premises, this would be is difficult (perhaps impossible) to determine archaeologically. No clear “marketplaces” where merchants/manufactures gathered to trade goods have ever been identified either but places where such activities might have taken place (broad streets and large, structure-free areas) are evident at certain sites. There has not been a marketplace or shop at any indus site. However, it is not necessary to have a physical space for there to be a market. 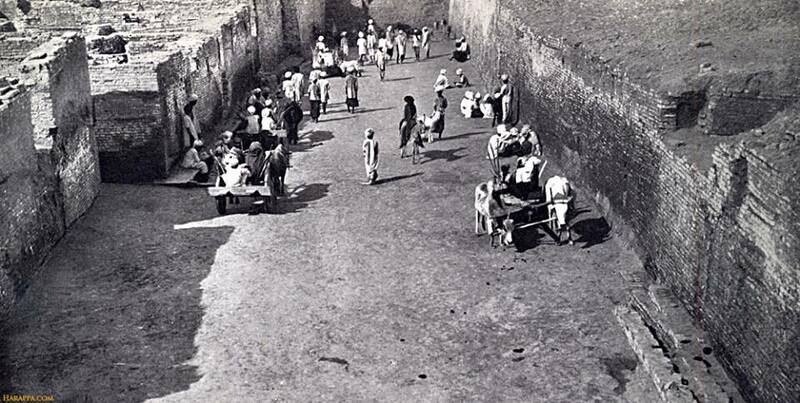 Above: Mohenjo-daro, First Street, with speculation on its bazaar use by Mackay.